Congrats! You’ve hit your weight loss goal…now what? Another trip down Weight Regain Lane? No way! You’ve worked way too hard. But the fact of the matter is that keeping weight off is the hardest part for most people. 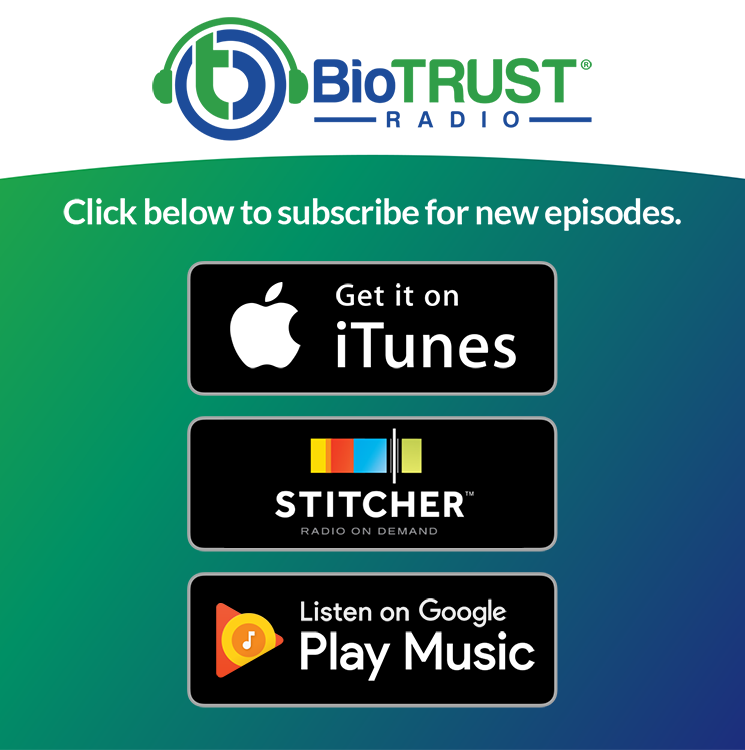 That’s why this episode of the BioTrust Radio podcast is a must-listen as Shawn and Tim reveal the top 14 tools, tips, strategies, and habits to help you maintain your weight. Shawn: All right, we are back on BioTrust Radio. Man, I am with my favorite podcast partner, Tim Skwiat. Shawn: And this is Shawn Wells. Podcast partner, I like that. Some nice alliteration. And we’re here to talk about life after the diet – and keeping weight off. We were just talking with Jacob Mulder who’s in this Dallas office, on the R&D team, and he’s working on the competition, the contest to not just lose weight but keeping weight off. And he brought up several things, because he listens to this show. He’s part of our team. But he’s also someone that’s struggled with keeping weight off and is dieting, and he brought up so many good thing. He actually brought up the title itself, which we liked, even though we’ve brought up recently maybe diets don’t work and maybe get away from the word “diet” and think lifestyle. You know, life after the diet. So, a lot of people are doing this BioTrust transformation and it’s a great way to kick‑start yourself and get yourself in motion. But I would say one of the first things is go over to the VIP area of the Facebook group “BioTrust VIP.” You’re going to need help. If you want to focus on keeping weight off, you’re going to need support, and that’s one of the things that we, I guess, talk about very strongly here is having that support structure. You can’t go it alone. So, you know, have other people that are going through the same things you’re going through or have been through it in the past. Our coaches are excellent, and Tim and I have put on weight in the past and taken off weight in the past. Right, now I’m actually struggling. I had one knee surgery. I have another knee surgery coming up. I’m more sedentary than I want to be and I can’t even help that because I just can’t go run, can’t go play volleyball, can’t do the things that I want to do. And sometimes it’s extremely frustrating. So I’ve had to alter my diet in ways that I wasn’t ready for. It’s also the winter. It was also the holidays. So, I go through this stuff too. I’m a dietitian and, you know, I put on weight and now I’m like okay, I’ve got to adjust here because the way I was eating doesn’t even work right now and I’m about to get my second knee done. I’m trying to knock this out during the winter so I can play volleyball and everything in the summer, but it’s tough. And I’m still working out at the gym. I do every day and I do my physical therapy. But, obviously, I can’t be as active as I want to be. I can’t, you know, take the dog for a two-mile walk in the evening. I can’t, like I said, play volleyball and do some of the things I want to do. So, I deal with keeping weight off. Tim deals with keeping weight off. Every one of our coaches has dealt with keeping weight off. And then there’s people that are going through it, that are there to support you and listen to you and need your help. So, it’s great to be part of a community, and I would encourage you to do that. I wanted to read this one thing, because Jacob Mulder brought up something that I think was a very powerful point. He basically said, and admitted, which is as he said, the first step is addiction and admitting you have a problem and you are addicted. And I’m reading this book by Jocko Willink. He was a Navy SEAL. It made popular by Tim Ferriss, “Tools of Titans.” You can check that out, but he also has his own podcast and his own books. “Extreme Ownership” is one of them. I’m looking at this “Discipline Equals Freedom Field Manual,” which is just some easy quotes to read. But this is addicted to sugar. And I don’t 100% agree with this, but I just want to read it because it’s really good, and this is definitely a Navy SEAL talking. So, you know, harsh truth. Get ready. Shawn: “Sugar truly is addictive. It stimulates the same parts of the brain as heroin and cocaine. When you have it, you want more of it. And you know this to be true. That’s why you can’t stop eating it. And when you do stop eating it, you feel withdrawal, headache, irritation, anxiety, lies. The lies will come and they will come from you. The lies will tell you it’s no big deal. You can have just a little. It isn’t worth it to feel this bad. The body needs carbs.” This is true for glucose. You don’t necessarily need to eat carbs to make the glucose. You know, I’m a keto guy, but it’s true. The body does need glucose. And you can certainly eat healthy carbs, and he’s making the argument against sugar. He says, “You’ll rationalize and start to listen to the lies. Don’t. Stay strong. Get off the sugar train. Get off the addiction. Stop eating sugar.” I’d say something else there is that I typically don’t eat carbs. But I do eat fiber, like, have vegetables and whatnot on keto diet, but I do eat sugar. I’ve just found its place because to Jake’s point, he’s addicted and he feels deprived when he’s on a diet, and he’s trying to figure out once he does lose all this weight, he’s confident he will, what does he do after that for keeping weight off? Because he always kind of comes crashing down because he wants to have a Snickers. And he said he sits down after dinner and watches TV and then come the cravings. It’s hard. He’s battled this sugar addiction. I’ve found a place for it, for me, that I feel is healthy, that I can still have some Pop Tarts and Oreos and, you know, things like that that are kind of comfort foods that I might miss. That like if I see other people having, I feel deprived. And yes, this is a dietician saying this, and it’s fine. So, I have them when I’m playing. And again, I’m not getting as much chance to do that now, but I’m playing like volleyball. Especially I play like eight hours, all day. I just have what I want to have. And so if you’re active enough, I think you can deal with some of that. But let’s talk about addiction and are you honest with yourself, and how powerful sugar is. Do you want to speak to how powerful some of these, not only sugar addiction, but how addictions are playing a role in undermining your health, happiness, and weight management? Tim: Yeah, sure Shawn. Among the scientific community there’s controversy over whether or not food is really addictive or not. So, this discussion is not about that. This discussion is more about the power that food has over us, I think, and that certainly plays a role in weight maintenance – and keeping weight off. And I think that’s what we should dig into a little bit more. We’re using the word “addiction,” and if you disagree with that, that’s fine, but recognize that there’s people out there that have a hard time. Tim: What I’d like to say is it’s a relationship with food. Tim: So, there’s certainly evidence that sugar and refined carbohydrates can light up the centers in our brain similar to those centers that are lit up by drugs like cocaine and things like that. And what I find interesting is that that center of the brain is very closely located to the habit-forming center of the brain. So we get this surge of feel‑good chemicals, like dopamine, for instance. And right next to that is this area of the brain that says, “Hey, that made me feel good when I wasn’t feeling so good, so I’m going to go back and I’m going to do that again.” So, I think this awareness of triggers, environmental triggers, social triggers, emotional triggers and things like that are key to keeping weight off. Start to recognize. Start to just create this awareness of what is driving you to do that. If it’s sugar, for instance, what are the factors that are kind of triggering that trip down Sugar Lane. But then also, if we know that, physiologically, then maybe we can start to add some behaviors that naturally increase those levels of feel-good chemicals. For instance, like we’ve talked about before, being outdoors in the sunlight can naturally increase our dopamine feel-good chemicals. Having conversations with people that we love and just talking, having social interaction can do that. Exercise can profoundly increase those feelings. So, if you’re not doing those things on a regular basis, start doing those things more can be important strategies for keeping weight off. And then from the nutritional side of things, one, just to become aware. Create that awareness, start journaling how you feel and how you feel afterwards as well. Did it really solve the problem that you might have been having? Did it really make you feel as good as you expected, or 15 minutes later? How long did it last? Fifteen minutes later are you disgusted with yourself? And then what does that lead to? So, as you start to identify these things, you can start to see the bigger picture. And you can start to fill in the gap that you’re trying to fill in with food. We also talked about the whole concept of “everything in moderation,” which I don’t think is very effective advice for keeping weight off for many people. I think there’s a small group of people that that works quite well for, and that’s fine. And this is probably one reason why diets don’t work, like we talked about before, is that people generally have an all‑or‑nothing kind of mindset. So, that idea of everything in moderation, if you don’t feel that applies to you, that’s okay, because it doesn’t apply to everyone. In fact, from a nutrition standpoint, it actually may not encourage the most effective long‑term behaviors. Because when we look at the habits of people who are successful at keeping weight off, they actually have very little diet variety. And what I mean by that is that they tend to eat the same foods pretty consistently over time. And that’s important. That’s one thing that we should talk about. Another thing about folks who are successful at keeping weight off is that they tend to eat similarly on weekdays and weekends, which is also something that that we can talk about. But going back to eating similar foods, and I’m not saying that you have to eat the same foods every single day, but maybe you have a menu of similar meals that you prepare or similar foods to eat pretty consistently. You know what to expect from them. But another reason that I like that is because it takes the decision-making process—you don’t have to make as many decisions. Shawn: That that’s how keto can work for me. Shawn: People ask, is that a maintainable lifestyle? For me, it is because it’s limiting my options, right? Shawn: That’s one way. I mean, obviously there’s some science behind keto and I could talk about that for a long time. But one of the ways is like when I go with the guys, or whatever, to lunch, I have a hamburger salad with ranch dressing or something. I can’t have the bread on the table. I can’t have the chips on the table at a Mexican restaurant. I can’t have a sweet tea. I can’t have a Coca-Cola. I can’t have the bun. I can’t have the croutons. I can’t have some of these things. Okay, so now this is limiting some of my options. Shawn: Because it’s not good enough. Shawn: It’s got all the damage that it’s going to do, but it’s got none of the upside. So, I want, when I have it, to be something that’s worth it, that’s great. I want it to be something I enjoy, I look forward to. So I think if you can get to the point where you make some of these experiences of your treats just, you know, like fewer and far between and you just make them great. You’ll make better food choices, you’ll enjoy eating more. But to your point, I have limited my diet and I think that’s led to some of my long‑term success is that when I look up at that board—because we’re all there, right? It’s either a menu or like that board of lights that’s in front of us when we’re in line at some restaurant or whatever, and you’re trying to make these decisions and you’re looking at all these delicious things. And usually the most delicious things and the ones that everyone picks are the three pictures that are up on the board, right? Shawn: Or if you have a menu, like there’ll be one picture per page. And I would bet you that 95% of the people pick the picture. Shawn: And even though there’s like a hundred options, there’s like three things that people are really ordering out of that menu or up on that board, right? Shawn: Because your brain is looking at you, like “That looks really good.” But now I’ve gotten used to becoming difficult, right? Because I’m like, “Yeah, so I want a burger” and they’re like, “Okay how do you want it?” I’m like, “Well I want a ‘no bun’ and then I want a salad,” and you’re like, “You want a salad and a burger with no bun?” “Can you put the burger on the salad with the no bun? Make sure there’s no croutons on it. I’ll take the ranch on the side.” And they’re like, “Okay,” and it’s almost seems difficult. And you get used to becoming difficult, and it’s not really that difficult. Shawn: But you get used to making adjustments and ordering it your way, which is a good behavior, I think. Instead of like what’s easiest and that easy option to just point to on the board or on the menu, that’s like probably one of the worst things probably for you to choose. I’m sure it’s one of the most delicious things and addictive things. Shawn: But, you know, now I’m used to making this decision that’s not on the menu, not as quick or easy. And it’s, you know, limited options, like you said. Shawn: So I think that’s led to my long-term success for keeping weight off. And then, again, it’s not all-or-nothing. I do reward myself for when I’m athletic and when I have high activity, because I’m using it, I’m burning, and I don’t even feel like guilty at all. It’s actually just a fuel and that’s how I look at it. It’s like “Sugar is fuel. Okay. Well, I’m out here burning it. Cool.” Keeping weight off is a balancing act. Shawn: If you’re active enough, you know, that’s why people that are super-active, that are highly active like some, you know, Usain Bolt, you could probably eat anything. But most people are sedentary. And to Jake’s point, you know, a lot of people they get home, they don’t have time to exercise. They have a full workday and they have kids, they’re got to cook, or whatever, and then it’s just like, “Ah, I need to unwind.” So, if I just sit down after dinner and just watch TV. And it’s very easy at that point when you’re sedentary to, you know, you’re not moving, you’re bored kind of, just eat these foods. Shawn: And again, we’re not journaling them, we’re not thinking through them. We’re just kind of, like you said, impulsively choosing something that lights up the dopamine. Tim: Yeah, exactly. So, a lot of lot of awesome things that you shared there, Shawn. You talked about making decisions, and that’s one of the advantages of limiting your variety, is there’s something called “decision fatigue.” When you’re tired because you haven’t slept enough, you’ve worked all day long, you’ve had to make decisions at work all day long. So the last thing you want to do at the end of the day is decide what you’re going to cook and what you’re going to eat. So you’re going to revert to habit. And if your default is the junk food or the fast food, or whatever it is, then that’s probably not the best choice for keeping weight off. However, if you’ve made it your habit to choose from a menu of three or four healthy meals that you know how to prepare or pick up, then that’s—boom—you don’t have to worry about making a decision. So that’s something that you had kind of alluded to, that I think is important, is to respect the decision fatigue. It kind of like falls under that umbrella of willpower, in a way. If you’ve worn out that ability to make decisions at the end of the day, then it’s going to be harder to make the healthy decision unless it’s already become a habit. So, just limiting your menu, keeping it to those things that you know support your goals, is one thing. Shawn: Similar to habituation with caffeine. Shawn: You know, you adapt to it. They’ve shown in studies that by the third day that you need that level of caffeine just to get to baseline. Shawn: Just to get to where everyone else lives. So when people say, “I need my caffeine and I need my Starbucks in the morning,” they’re being honest. And same with this sugar addiction, right? You know, “I need it. I need it!” You can you can see people get angry. I remember Claudia, my foreign exchange student, she had a very healthy way in Italy. You know, they have very small sodas and they have smaller candies, and when she would have candy or something she would pull it out and she said people reacted like in her classroom like zombies. She said it scared her. Like people would almost like want to steal it, like, “I want that.” You know, like they want it, and it is like an impulsive response. Shawn: Let me ask you about impulses. Thoughts there? Tim: Well, if you don’t mind going back just one thing. Tim: Because I think that ties into the second thing that I’m going to come back to. On the flipside of habituation, which ties into dietary variety, is that you have sensory‑specific satiety, which means that we get tired of one food. Tim: We get full of it. But if we moved on to something else, we could eat more. That’s the whole idea of a buffet. You can eat a lot more food when you have all these different options in front of you. So a buffet is kind of an extreme example, but the more variety you have, the more you’re going to tend to eat. Just think of it more concretely as that satisfied my salty cravings, but I now need something sweet or something like that. You could think of it that way. But you can eat more if you have these different profiles of foods, textures, tastes, and things like that. Tim: So that’s why limiting variety is also helpful in managing food intake. Now coming back to the impulsive type of eating, like you had mentioned also, when you were looking at the menu, you knew that you could make a choice that was specific to your goal, right? Tim: So, to me, keeping weight off comes back to the notion that choices have consequences, right? And this is all about awareness. It’s all about mindfulness, right? Tim: So, tying it all together. Shawn: Right. I’m thinking through my choice and I’m saying, “This is the thing I need to do to keep myself in ketosis,” in this case or whatever it is. And again, you can do whatever diet you want to do, or lifestyle, I should say. But that’s breaking down that impulse. You’re getting away from the bright shiny thing. Shawn: And again, we’ve talked about like when you walk in a convenience store, it’s full of bright shiny things that are built on your impulses. The caffeine, the tobacco, the lottery, the alcohol, the sugar. There’s colorful sugar in the form of soda and Gatorade and candy, and it’s like all at the register, and you just you’re surrounded by it, right? Shawn: That’s all impulse. But if I say, “Look, I can’t do those things because it puts me in the wrong place. I need to do this thing and it’s got these steps.” So now I’m thinking through it, and is that mindfulness. Shawn: And it’s putting a block, a halt, on that impulse, right? Tim: Exactly, 100%. If you take if you pause just five seconds to think about how this choice impacts me, what are the consequences of this choice, how does this impact me in the long-term; especially if this choice is made consistently over time. Is this the right choice for keeping weight off? Tim: That’s the big thing. If it’s just one time, no big deal. But if this is the choice you make consistently, there what’s the consequence. Shawn: They’re habits. And let’s be real about habits. And if it’s happening all the time and it’s destructive, then we could label it an addiction. And it’s something that’s not healthy and we need to be real about, and that’s we’re having a group, social structure, awareness of it, accountability of it, having other people say “Yes, I struggle with that, too.” All that can be helpful, like we were talking about, with our VIP group or just your friends and family. If you’re interested in keeping weight off, hopefully you have positive role models around you. Hopefully like the other people you’re going out to lunch with aren’t all eating desserts and, you know, junk or whatever, the things that you feel are like your impulses. Because that’s going to make it extra hard, right? Shawn: But they’re eating it, and what do you do in that case? So you’ve held off for 8 weeks or 12 weeks, or whatever, to do your diet. You’re like, “No, I’m on my diet, guys.” But at some point you revert back to habits or other people around you make it harder, or stress comes up. So what then? Life after the diet. What then when all your friends are having this stuff? Tim: Yeah. No, there’s a lot there and I think that one thing is—just going back to the consequences—just remember, you could be mindful of your choices in that they have consequences. And you can do those things. Just don’t judge yourself when you make those choices, but recognize that the consequence may be changing your target. You may have to deviate your expectation. Either you deviate the choice or you deviate the expectation, right? Tim: So it’s just a spectrum, right? The cost of this choice is gaining weight long-term, or the benefit of making an alternative choice is keeping weight off, if that’s your goal. No one’s judging you. Just know that all your choices have consequences. Shawn: Right. Don’t shame yourself. Don’t beat yourself up. I mean, this is a physiological thing that’s happening, you know, clearly because we talked about it. You know it’s not the healthiest choice. You know what the repercussions are. I can gain weight. Shawn: I can feel crappy after I eat this. So make a decision. Take the impulse away. Step back for a second, right? Shawn: I mean, this is how you make healthy decisions. You think it through before and after. Like okay, what’s the repercussions if I’m about to do this? One, okay I had it. How do I feel now about it? Was it worth it? Shawn: So now we’re making better decisions. You’re saying this is a lifestyle. The life after the diet – and keeping weight off – is a series of decisions, infinitum. Shawn: I mean, this is for life, and realize that. And realize that, we’ve talked about before, that like, yes, if you have one candy bar, fine. It’s like I’ve said before, when you have that one salad, you know, and you’ve ate McDonalds 30 days in a row, that one salad doesn’t make you healthy. Shawn: You know, it’s like, no, what you’re going to say to yourself is, “Look, I’m in it for the long haul. I had a candy bar. That’s fine, if it’s 300 calories over the week. Not a big deal. So, that’s fine. Maybe tomorrow I do a little bit more exercise or whatever to help with keeping the weight off. Shawn: But, you know, I just adjusted my expectations or I adjust my decision-making over the next period of time. We’ve talked before, like it’s okay to fast or something. Shawn: You know, to exercise more. Whatever it is. But in the in the big scheme, we’re looking at lifelong decisions. So it’s the series of decisions. It’s the long play. So don’t beat yourself up and don’t think diet. Just think decisions. Tim: Yeah. It’s the cumulative average of your decisions, right? I mean, it’s a lot more than a mathematical equation. But basically, like you were saying, some people talk about the 80/20 or what you do 80% of the time. And I think that’s important to look at, too. Tim: Well do you need to change your group of people? And for some people that’s a lot harder than other people. So that’s something that’s really important because social support, when you have positive social support, it’s one of the most important things that you can invest in for your health, for your success. Not just not just health, but like in business and your professional life, and things like that. You know, social support encourages you both when things are not going so well and when things are going great. It gives you a genuine pat on the back, which we all like that recognition, right? It’s important that those people are going through the same things as you, sharing similar experiences. Tim: So, knowing that it’s okay. We all want to know that we’re unique and special, but at the same time the sense of common humanity is really important for self-compassion. And it’s really important that we have that self-compassion. Not feel sorry for ourselves. Not that that type of negativity, but just know that this is common, this happens to people, and it’s okay, and now I’m going to pick up the pieces and get back. So, sharing similar experience is important. Getting inspiration from other people. Like we’re all a little competitive on the inside, so it’s nice have this support network of people that are smarter, more successful than you. So hopefully you’re not in that group of five people, you’re not the most successful or the happiest person, and rarely is that one person going to have it all. Usually somebody has the bits and pieces. So you’re kind of like competitive to go after that person that’s in that group, too. But social support is tremendously important. It’s one of the most common factors among people are successful at keeping weight off. Shawn: Been able to maintain anything positive. Shawn: You need those positive people in your life. Like you said, sometimes it’s hard to get rid of maybe some of the negative voices. It can be complex. Shawn: But at least getting some of these positive voices in there helps crowd them, helps limit them, helps limit their power. And then it helps empower you, because ultimately you control your life, you control your life. Sometimes you feel like it’s out of control, like with these impulses, these choices are made for you or people are making choices for you, or you’re on autopilot. But, you know, take the power back. Take the power back. Shawn: Put the right people around you, start making better decisions, be mindful of your decisions, start journaling. Not just journaling your food, but journaling your activity, journaling the things that are going on in your life that’s mindfulness, journaling your gratitude. That means like your thankfulness for all the things that go right in your life. And then things might really start changing for you. Shawn: If you’re that mindful, if you’re that thankful, if you’ve got the right people around you, if you’re aware of your decisions, if you stop the impulses and you start breaking things down, start realizing the repercussions of your decisions. And you don’t beat yourself up for them. You just know it’s an equation. It’s just decisions have consequences and that’s okay. Then all that would lead to long-term success, I would think. Tim: Yeah. I like the journaling way of saying journaling, because what I was thinking was self-monitoring, and journaling is a way to do that. When people think about self‑monitoring and health, they often think about like the scale and weight loss and that’s certainly one way. Tim: Or Fitbit. But here’s an interesting way to do it. Try to view your life from a third person’s view. Literally, pretend that you’re doing a documentary of Shawn Wells, and carry the camera around and follow Shawn all day long and try to do your best to objectively look at the choices you’re making and what that person is going through. So looking through that lens is kind of interesting to see how we’re making decisions. That’s another way to just raise that awareness and that mindfulness. So I think self‑monitoring, mindfulness, awareness, journaling, all those things are really important for keeping weight off. Another one that seems kind of interesting, at least among people that are successful at keeping weight off. Something that’s a pretty common habit is that they stay up late less at nighttime. So again, sleep is going to be an important component, overall. But, you know, if you’re staying up late at nighttime, for most people that’s usually not the result of like changing the world. So that would be another thing I’d watch out for. Shawn: Yeah, and less impulsive when you get your sleep. Tim: Exactly. And then finally, I think one other thing that I find is that people that are successful, with the theme of life after the diet, I think one thing those people who are successful at keeping weight off is they have a high level of physical activity. It’s an important component and something that we talk about regularly. We’ve talked about its effectiveness in weight management before and how it can really help in that regard, too. Shawn: Well, not even just conscious physical activity, but subconscious, like just the fidget factor. Shawn: Just moving around, like even while we’re sitting here, you’re constantly adjusting your pelvis, your hips. That’s burning calories, right? Shawn: The body in motion stays in motion, right? So, being sedentary, we’ve talked about, is definitely something you don’t want to do, sitting syndrome etc. I think all that is a great way to sum up that there is life after the diet. Don’t beat yourself up. Find a community, and hopefully we’re part of that community. Check out our VIP Facebook group and check out our podcasts. Hopefully you’ve enjoyed them. We enjoy doing them for you. We have a blog as well. A lot of great information. So, we’ll talk to you next time. We really appreciate you, and keep making healthy decisions. Thanks.